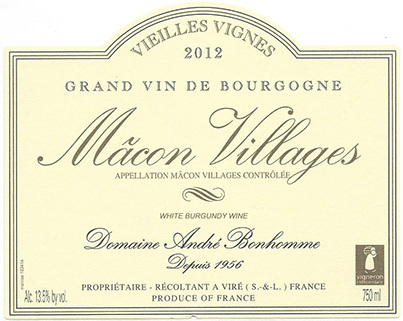 This humble domaine was founded in 1956 by André Bonhomme. Back then, Andre's father Joseph owned four hectares of vines that were sold under the Mâcon-Viré appellation. Through careful vine growing and vinification, André received enormous respect from his colleagues. 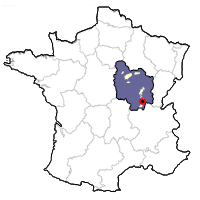 He was not only the co-founder of the Independent Winemakers of the Saône-et-Loire; he also was one of the principal initiators of the new Viré-Clessé appellation in the 1990s. André has now passed the torch to his daughter Jacqueline and her husband Eric Palthey. They were recently joined by their son Aurélien who acquired a enology degree in 2007 and his brother Johan who recently completed his wine studies. The domaine presently covers 11 hectares located on the clay and limestone soils of both the Viré and Clessé communes. 98% of their production is white, although they also make a little red from Gamay. Some might say that wines from the Mâconnais don't age, but during one of our visits to the domaine in May, Aurélien opened a bottle of 1995 that showed beautifully with no hint of oxidation or lack of fruit. Aurélien gave us a different dusty bottle to taste later during the trip. I told him I would email him after tasting it with my colleagues and relay to him our guesses as to what it was. A couple nights later while in Savoie with my traveling companions, I popped the bottle at our hotel. We were all blown away by how much exotic fruit showed, still buttressed by lively acids. Our guesses: 1989, 1986, two 1985s and 1981. I e-mailed Aurélien the next day. His response: Nice try, but older. It was actually a Mâcon-Viré 1969. Wine can be a humbling experience. So how does the family do it? Aurélien thinks that Viré-Clessé's proximity to the Saône River enables its producers to make wonderful sweet wines. Perhaps this particular microclimate even gives the dry wines a wonderful exoticism and age-worthiness. As far as work in the vineyards go, not much has changed since André took over the domaine from his father. They work organically. Copper is deployed to treat mildew and sulfer for powdery mildew. The family attempts to keep these sprays to a minimum so that the plant can defend itself. They don't use any chemical weed-killers between the vines. Certain strains of hay are planted between the rows. This aerates the soil and brings it valuable nitrogen. Insecticides: taboo! In fact, the family actually encourages certain predators that they feel create a natural balance in the vineyard. Harvesting and Vinification Yields are kept low. The grapes are picked by hand, with harvesters instructed to leave any unripe or rotten grapes on the ground. The grapes are delicately pressed with their stems in a balloon press. Parcels are vinified separately using only their indigenous yeasts. All wines go through malolactic fermentation. The wines are lightly filtered before bottling so that they are clear and brilliant. Sulfur at bottling is 80-80 mg/liter (the maximum permitted in France is 250 mg/liter). Some wines are aged in temperature-controlled stainless-steel tanks while others are barrel-fermented. Underneath the winery is a very humid, dark cellar, whose moist walls are stained black with mold. Certain cuvées spend up to 24 months in barrels in these slowly-maturing conditions. "You can never make great wine without great grapes. 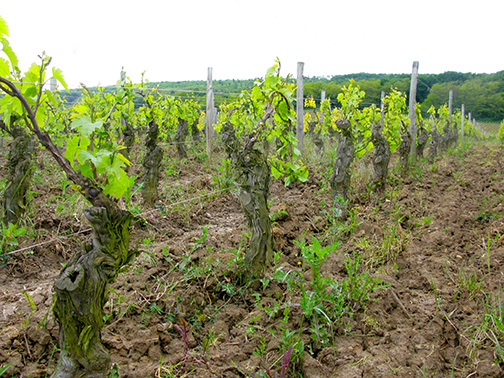 "The domaine releases their bottlings much later than many other producers in Burgundy. Even after such extended aging, they often wait six months before putting their wines on the market. Time moves slowly at Chez Bonhomme. These are white wines that taste great on release, but have what it takes to endure. Don't be afraid to hang on to some bottles. You will be rewarded for your patience. The family owns a couple of hectares in outside the Viré-Clessé boundaries where they make this wine. It is aged in tank for 18 months, and shows floral and citrus aromas and flavors. Food match: They recommend this wine with goat cheeese, charcuterie, seafood, frog's legs or escargots. This comes from 2 hectares of parcels 6 to 30 years-old that are planted on clay and limestone that has a high quantity of small stones throughout the vineyards. It is higher than most of their other vineyards at 340 meters. Yields are 50 hl/ha. The wine is fermented and aged in stainless-steel for 18 months. Tasting notes: This wine is fresh and fruity, with notes of pineapple and honey. Food match: It is a great accompaniment to seafood or on its own as an aperitif. 12,000 bottles made. This comes from a number of different parcels (totaling 3.5 hectares) aged between 28 and 70 years-old from clay and limestone soils. Part of the wine is vinified in stainless-steel and the other part in oak for a year. After, both are blended together and aged in larger oak barrels for another year. As its name suggests, this comes from vines that have an average age of 80 years. The yield is slightly lower than the other cuvées (35 to 40 hl/ha) giving it slightly more concentration, elegance and aromatic complexity. Like the Cuvée Spéciale, part is aged in stainless-steel and the other part in oak before being blended together and aged for another year in larger barrels. Food match: Amazing with fleshy white fish, veal sweetbreads or scallops. 16,000 bottles made. This comes from a particular plot in the far north of the appellation called l'Epinet that was planted in 1923. This wine is barrel-fermented and aged in oak for 24 months, and possesses more profound fruit and minerality than the other cuvées. Although somewhat austere in its youth, this will easily last for ten years. Only 800 hand-waxed bottles available. Made from vines nearly 100 years-old from a plot called Quintaine, between the communes of Viré and Clessé. This plot has unique soil comprised of Bath limestone and Oxford marl. The slope faces east and southeast, facing the Quintaine Chapel. Like the preceding wine, it is fermented and aged in oak for 24 months, yielding a racy, mineraled and complex wine built for the long haul. 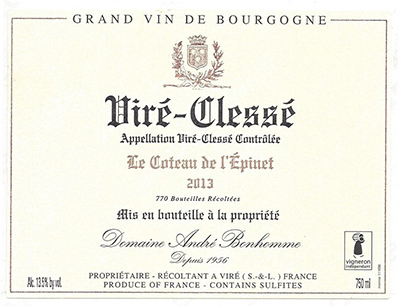 The label is one of the first that the domaine ever used in the 1950s. Annual production is only 2,000 hand-waxed bottles.